Heeft u een vraag voor Leisure Mount View Holiday Inn? Ontworpen voor zowel zakelijke reizigers als toeristen, is het Leisure Mount View Holiday Inn ideaal gelegen in Liyangahawela Watta; één van de meest populaire buurten van de stad. Het hotel ligt slechts 11.1 km van het stadscentrum: lokale bezienswaardigheden zijn dus snel te bereiken. Met de belangrijkste attracties van de stad - zoals Anthony's Church - binnen handbereik, zullen bezoekers van het hotel de locatie waarderen. Profiteer van de ongeëvenaarde dienstverlening en voorzieningen in dit hotel in Bandarawela. Enkele voorbeelden van faciliteiten die dit hotel biedt zijn wi-fi in openbare ruimtes, parkeerplaats, roomservice, vervoer van/naar luchthaven, familiekamer. Hotelkamers zijn zorgvuldig ingericht om het hoogste niveau van comfort te bereiken, met wekservice, bureau, balkon/terras, internet (tegen vergoeding), internet in iedere kamer. Of u nu van fitness houdt of gewoon lekker wilt ontspannen na een drukke dag, het kan allemaal in dit hotel dankzij faciliteiten als tuin. Het Leisure Mount View Holiday Inn is een slimme keuze voor mensen die reizen naar Bandarawela: een ontspannen verblijf is gegarandeerd. Prachtig uitzicht vanaf balkon, heerlijk diner met echt goede curries. Ontbijt was daarentegen waardeloos. Helemaal het ontbijt dat we meekregen voor onderweg. Dat leek nergens op. Ook het gedoe rond het afrekenen was onprettig. Mooie verkooppraatjes, maar in de winkel zelf, bleek alles veel goedkoper. We read the other comments about the view from the hotel but still, it blew our mind when we see it in person. Right outside our balcony is one of the most beautiful sceneries we have seen in our trip. The room was spacious and clean with big windows that let you appreciate the view from your bed. We had a swing bed, which is an interesting experience. Although if you tend to move a lot during your sleep, we wouldn’t recommend. The breakfast and dinners are very tasty, especially the dinner, the best rice and curry we had so far. To top it all off, the service from the staff was top notch. They weare all super attentive to our needs and help us arrange tours and transport. We will be back for sure! The staff was good and helpful. We booked a double room but were "upgraded" to a comparatively big twin room. The view from the balcony was stunning. However, the floor of the room was a bit dirty so we could not walk on bare foot. There was no Wi-Fi reception at our room. We did ask the staff about it and he explained that our room was distant from the Wi-Fi reception area (what an upgrade?!). Food provided was so-so which seemed like re-heated with microwave. 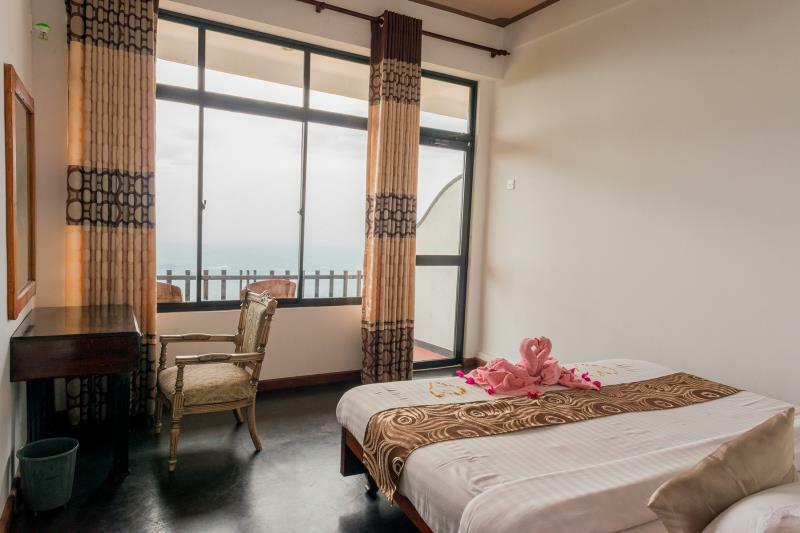 A fantastic location high up in the clouds surrounded by a tea plantation and a 5 minute walk in to town. The staff were very friendly and ran the place like a family business. My only negative is they didn't have my breakfast on the day of leaving after I was told twice the night before it would be. I left the place feeling cold and hungry what wasn't the best lasting impression. We usually stay at higher end establishments but the views and general location is why we stayed here. They were priceless! I went there during the off season so they allow me to upgrade the room without any aditional charges. Also it was one of a best stay during my visit. The staff is really friendly and the food is great. It was the tastiest meal I had on the entire trip. The view is very nice. Bugs are expected in mountainous area. The host upgraded our room. The room was spacious and comfortable. Nice staff. They arranged a tuk tuk driver to take us to Lipton Seat. The driver was helpful, stopped as we liked to take photo, told us about the tea plant and introduced surrounding places to us. The scenery of the mountains and plantations from our room and private balcony was incredible! The location is perfect for a peaceful quiet getaway. The room was spacious and clean with a good bed. The staff and manager ther were so friendly and helpful, and quick to assist in anything. The dinner served there is the best sri lankan food I had. I highly recommend this place!!! Excellent views but far from most of the picnic spots. Food is awesome. Travelling to places like Ella/Nuwaraelia would require additional 4000lkr for a taxi from Haputhale. Lack TVs and fans in rooms. The advantages are awesome staff and excellent views from the rooms. Enjoyed two nights here. It's an easy 10 min walk into town. Staff are super helpful with good info about the area as well as getting around Sri Lanka,. Delicious dinner onsite. Nice big room with incredible views. All in all a good stay. Family run Inn. Best daal thus far and excellent home made food. Very hospitable. The room has a lot of housefly which my kids got distracted and did not like it, food was average, Pradeep was only genuine host. We stayed here for 2 nights in one of the deluxe rooms, which are on the top floor next to the dining room. The views from these rooms are amazing, overlooking tea fields and foothills, and then on down to the plains which seem to stretch on forever - sunsets were glorious. Breakfast was a mixture of continental and Sri Lankan food with a huge amount provided. The same goes for the evening buffet, which at 900 rupees per head was very good value. We like our food spicy, so asked for a chili sambal to pep it up, and it was delicious. Hassan, the young man who runs the place, was very helpful, making sure we had everything we needed, and took a real interest in our travelling life. I was very keen to find out more about Sri Lankan cooking, and had mentioned that I was looking to buy a clay cooking pot for that authentic taste. Would you believe the next day, as we left, he gave me one from his mum's kitchen. Thank you Hassan, you were a lovely host! This hotel was just magical, it's literally in the tea plantation. Rooms amazing views loved when checked in you get a nice big pot of tea . The drive was worth it. The only thing I would change is dinning menu for buffet options be nice to have something western like chips, fried potatoes with fresh vegetable with no spice. The hotel manager was extremely helpful in sorting out a trip to Horton Plains and arranged a packed breakfast for us. The dinner was delicious and good value for money. The room was very comfortable (although we weren't convinced by a swinging bed!) and spotless. You can walk through tea plantations and up to a bird sanctuary from the front door.